Population Ranked 44th in the U.S.
Ranked 48th in the U.S.
Montana (IPA: /mɑnˈtæ.nə/) is a state in the Pacific Northwest and Great Plains regions of the United States of America. 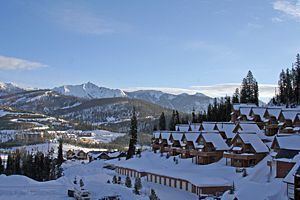 The central and western thirds of the state have numerous mountain ranges (approximately 77 named) of the northern Rocky Mountains; The state nickname is the Treasure State. Other nicknames include Land of Shining Mountains, Big Sky Country, and its slogan is the last best place. The state ranks fourth in area, but 44th in population with 944,632 and therefore has the third lowest population density in the United States. The economy is primarily based on agriculture and significant lumber and mineral extraction. Tourism is also important to the economy, with millions of visitors a year to Glacier National Park, the Battle of the Little Bighorn site, and Yellowstone National Park. Montana is one of several western states that is automatically associated with wide open spaces and mainly unpopulated regions of the U.S.A. The natural beauty of rolling hills, rocky mountains and prairies is home to a vast array of wildlife and natural flora. The rich heritage of the eleven Native American tribes living in the state contributes to its distinct cultural flavor as they have all maintained the traditions of their past. While names like Sitting Bull and Chief Joseph are linked to historical events that took place in Montana, the state was home to Chief Plenty Coups, of the Crow Nation, who rose to prominence after reservation settlement. He was recognized as the single most important Native American tribal leader with regards to his leadership in making the transition to reservation life a peaceful and prosperous process for his people. In 1998, the site of his homestead near Billings was designated a National Historic Landmark. Politically, Montana remained fairly evenly divided between the two major parties during the 1970s and 1980s. Voters consistently preferred conservatives in local elections and liberals in national ones. 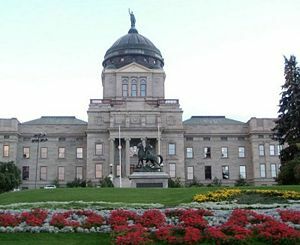 Since the 1990s, Montana politics have become more conservative, highlighted by tax protest movements, the election of a Republican as governor in 1992, and a Republican sweep of the state legislature in 1994. The state’s first female governor, Republican Judy Martz, was elected in 2000, but the statehouse returned to the Democratic column in 2004. Its name is derived from the Spanish word montaña (mountain) aptly named for the mountainous nature of the topography of Montana. With a land area of 145,552 mi² (376,978 km²) the state of Montana is the fourth largest in the United States (after Alaska, Texas, and California). To the north, Montana and Canada share a 545-mile (877 km) border. The state borders the Canadian provinces of British Columbia, Alberta, and Saskatchewan, more provinces than any other state. To the east, the state borders North Dakota and part of South Dakota. To the south is Wyoming and to the west and southwest is Idaho. The topography of the state is diverse, but roughly defined by the Continental Divide, which runs on an approximate diagonal through the state from northwest to south-central, splitting it into two distinct eastern and western regions. Montana is well known for its mountainous western region, part of the northern Rocky Mountains. However, about 60 percent of the state is actually prairie, part of the northern Great Plains. Nonetheless, even east of the Continental Divide and the Rocky Mountain Front, there are a number of isolated Island Ranges that dot the prairie landscape. The Bitterroot Mountains divide the state from Idaho to the west with the southern third of the range blending into the Continental Divide. Mountain ranges between the Bitterroots and the top of the Continental Divide include the Cabinet Mountains, the Missions, the Garnet, Sapphire, Flint Creek, and Pintlar ranges. The northern section of the Divide, where the mountains give way rapidly to prairie, is known collectively as the Rocky Mountain Front and is most pronounced in the Lewis Range located primarily in Glacier National Park. Due to the configuration of mountain ranges in Glacier National Park, the Northern Divide (which begins in Alaska's Seward Peninsula) crosses this region and turns east in Montana at Triple Divide Peak. Thus, the Waterton, Belly, and Saint Mary rivers flow north into Alberta, Canada, joining the Saskatchewan River and ultimately emptying into Hudson Bay. East of the Divide, several parallel ranges stretch across the southern half of the state, including the Gravelly Range, the Tobacco Roots, the Madison Range, Gallatin Range, Big Belt Mountains, Bridger Mountains, Absaroka Mountains, and the Beartooth Mountains. The Beartooth Plateau is the largest continuous land mass over 10,000 feet (3,000 m) in the lower 48 states and contains the highest point in the state, Granite Peak, 12,799 feet (3,901 m) high. Between the mountain ranges are many scenic valleys, rich in agricultural resources and rivers, and possessing multiple opportunities for tourism and recreation. Among the best-known areas are the Flathead Valley, Bitterroot Valley, Big Hole Valley, and Gallatin Valley. East and north of this transition zone are expansive sparsely populated Northern Plains, with rolling tableland prairies, "island" mountain ranges, and scenic badlands extending into the Dakotas, Alberta, Saskatchewan, and Wyoming. The isolated island ranges east of the Divide include the Castle Mountains, Crazy Mountains, Little Belt Mountains, Snowy Mountains, Sweet Grass Hills, Bull Mountains. The Pryor Mountains South of Billings and, in the southeastern corner of the state near Ekalaka, the Long Pines and Short Pines. The area east of the divide in the north-central portion of the state is known for the dramatic Missouri Breaks and other significant rock formations. Three stately buttes south of Great Falls are familiar landmarks. These buttes, Square Butte, Shaw Butte, and Crown Butte, are made of igneous rock, which is dense and has withstood weathering for many years. The underlying surface consists of shale. Many areas around these buttes are covered with clay surface soils. These soils have been derived from the weathering of the Colorado Formation. Farther east, areas such as Makoshika State Park near Glendive, and Medicine Rocks State Park near Ekalaka also highlight some of the most scenic badlands regions in the state. 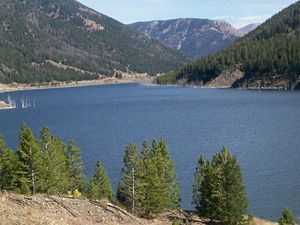 Montana also contains a number of rivers, many of which are known for "blue-ribbon" trout fishing, but which also provide most of the water needed by residents of the state, as well as being a source of hydropower. Montana is the only state in the union whose rivers form parts of three major North American watersheds: The Pacific Ocean, the Gulf of Mexico, and Hudson Bay which are divided atop Triple Divide Peak in Glacier National Park. West of the divide, the Clark Fork of the Columbia (not to be confused with the Clarks Fork of the Yellowstone River) rises in the Rocky Mountains near Butte and flows northwest to Missoula. There it is joined by the Blackfoot River and Bitterroot River and further downstream by the Flathead River before entering Idaho near Lake Pend Oreille, becoming part of the Columbia River, which flows to the Pacific Ocean. The Clark Fork discharges the greatest volume of water of any river exiting the state. The Flathead River and Kootenai River also drain major portions of the western half of the state. East of the divide, the Missouri River, formed by the confluence of the Jefferson, Madison, and Gallatin rivers, crosses the central part of the state, flows through the Missouri breaks and enters North Dakota. The Yellowstone River rises in Yellowstone Park in Wyoming, flows north to Livingston, Montana, where it then turns east and flows across the state until it joins the Missouri River a few miles east of the North Dakota boundary. The Yellowstone River is the longest undammed, free-flowing river in North America. Other major Montana tributaries of the Missouri include the Milk, Marias, Tongue, and Musselshell Rivers. Montana also claims the disputed title of possessing the "world's shortest river," the Roe River, just outside Great Falls, Montana. These rivers ultimately join the Mississippi River and flow into the Gulf of Mexico. Water is of critical importance to the state for both agriculture and hydropower. In addition to its rivers, the state is home to Flathead Lake, the largest natural fresh-water lake west of the Great Lakes. Man-made reservoirs dot Montana's rivers, the largest of which is Fort Peck Reservoir, on the Missouri river, contained by the largest earth-filled dam in the world. Vegetation in the state includes ponderosa pine, lodgepole pine, larch, fir, spruce, aspen, birch, red cedar, ash, alder, rocky mountain maple and cottonwood trees. Forests cover approximately 25 percent of the state. Flowers native to Montana include asters, bitterroots, daisies, lupins, poppies, primroses, columbine, lilies, orchids and dryads. Several species of sagebrush and cactus and many species of grasses are common. Many species of mushrooms and lichens are also found in the state. Native Americans were the first of many inhabitants of the state of Montana. Groups included the Crow in the south-central area, the Cheyenne in the southeast, the Blackfeet, Assiniboine and Gros Ventres in the central and north-central area and the Kootenai and Salish in the west. The smaller Pend d'Oreille and Kalispel tribes were found around Flathead Lake and the western mountains, respectively. On April 30, 1803, the Louisiana Purchase Treaty was signed by Robert Livingston, James Monroe, and Barbé Marbois at Paris. Thomas Jefferson announced the treaty to the American people on July 4. The area covered by the purchase included much of what is now Montana. The United States Senate ratified the treaty, with a vote of twenty-four to seven, on October 20; on the following day, it authorized President Jefferson to take possession of the territory and establish a temporary military government. In legislation enacted on October 31, Congress made temporary provisions for local civil government to continue as it had under French and Spanish rule and authorized the President to use military forces to maintain order. France then turned New Orleans over to the United States on December 20, 1803. On March 10, 1804, a formal ceremony was conducted in St. Louis, to transfer ownership of the territory from France to the United States of America. 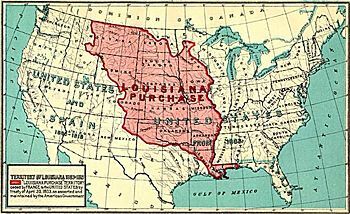 The Louisiana Purchase sparked interest in expansion to the West Coast. A few weeks after the purchase, President Jefferson, an advocate of western expansion, had the Congress appropriate $2,500, "to send intelligent officers with ten or twelve men, to explore even to the Western ocean." They were to study the Indian tribes, botany, geology, Western terrain and wildlife in the region, as well as evaluate the potential interference of British and French Canadian hunters and trappers who were already well established in the area. On July 3, 1806, after crossing the Continental Divide, the Corps split into two teams so Lewis could explore the Marias River. William Clark's went down the Yellowstone River. He signed his name 25 miles northeast of Billings. The inscription consists of his signature and the date July 25, 1806. Clark claimed he climbed the sandstone pillar and "had a most extensive view in every direction on the Northerly Side of the river." The pillar was named by Clark after the son of Sacagawea who was the Shoshone woman who had helped to guide the expedition and had acted as an interpreter. Clark had called Sacagawea's son Pompy and his original name for the outcropping was Pompys Tower. It was later changed (1814) to the current title. Clark's inscription is the only remaining physical evidence found along the route that was followed by the expedition. Lewis' group of four met some Blackfeet Indians. Their meeting was cordial, but during the night, the Blackfeet tried to steal their weapons. In the struggle, two Indians were killed, the only native deaths attributable to the expedition. The group of four—Lewis, Drouillard, and the Field brothers—fled over 100 miles (160 km) in a day before they camped again. Clark, meanwhile, had entered Crow territory. The Crow tribe were known as horse thieves. At night, half of Clark's horses were gone, but not a single Crow was seen. Lewis and Clark stayed separated until they reached the confluence of the Yellowstone and Missouri Rivers on August 11. Clark's team had floated down the rivers in bull boats. 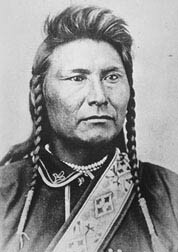 While reuniting, one of Clark's hunters, Pierre Cruzatte, blind in one eye and nearsighted in the other, mistook Lewis for an elk and fired, injuring Lewis in the thigh. From there, the groups were reunited and able to quickly return home by the Missouri River. Fort Shaw (Montana Territory) was established in the spring of 1867. It is located west of Great Falls in the Sun River Valley and was one of three posts authorized to be built by Congress in 1865. The other two posts in the Montana Territory were Camp Cooke on the Judith River and Fort C.F. Smith on the Bozeman Trail in south central Montana Territory. Fort Shaw, named after Colonel Robert Gould Shaw, who commanded the 54th Massachusetts, one of the first all African-American regiments, during the American Civil War, was built of adobe and lumber by the 13th Infantry. The fort had a parade ground that was 400 feet (120 m) square, and consisted of barracks for officers, a hospital, and a trading post, and could house up to 450 soldiers. Completed in 1868, it was used by military personnel until 1891. After the close of the military post, the government established Fort Shaw as a school to provide industrial training to young Native Americans. The Fort Shaw Indian Industrial School was opened on April 30, 1892. The school in 1904/1905had 17 faculty members, 11 Indian assistants, and 320 students. The school made use of over 20 of the buildings built by the Army. Other similar Montana schools that same year had 180, 175, and 83 American Indian students. The Battle of the Little Bighorn—which is also called Custer's Last Stand and Custer Massacre and, in the parlance of the relevant Native Americans, the Battle of the Greasy Grass—was an armed engagement between a Lakota-Northern Cheyenne combined force and the 7th Cavalry of the United States Army. It occurred June 25–June 26, 1876, near the Little Bighorn River in the eastern Montana Territory. Thousands of Indians had slipped away from their reservations. Military officials planned a three-pronged expedition to corral them and force them back to the reservations, using both infantry and cavalry, as well as small detachments of artillery, including Gatling guns. Custer's force arrived at an overlook 14 miles (23 km) east of the Little Bighorn River in what is now the state of Montana, on the night of June 24, as the Terry/Gibbon column was marching toward the mouth of the Little Big Horn. The Lakota, with their allies, the Arapaho and the Cheyenne, defeated the U.S. 7th Cavalry in 1876 at the Battle at the Greasy Grass or Battle of the Little Big Horn, killing 258 soldiers and inflicting more than 50 percent casualties on the regiment. Within roughly three hours after the beginning of the battle, Custer's force was completely annihilated. Only two men from the 7th Cavalry later claimed to have seen Custer engage the Indians: a young Crow whose name translated as Curley, and a trooper named Peter Thompson, who had fallen behind Custer's column, and most accounts of the last moments of Custer's forces are conjecture. Lakota accounts assert that Crazy Horse personally led one of the large groups of Lakota who overwhelmed the cavalrymen. While exact numbers are difficult to determine, it is commonly estimated that the Northern Cheyenne and Lakota outnumbered the 7th Cavalry by approximately three to one, a ratio that was extended to five to one during the fragmented parts of the battle. Following the Battle of the Little Bighorn, attempts by the U.S. Army to capture the Cheyenne intensified. A group of 972 Cheyenne were escorted to Indian Territory in Oklahoma in 1877. The government intended to re-unite both the Northern and Southern Cheyenne into one nation. There the conditions were dire; the Northern Cheyenne were not used to the climate and soon many became ill with malaria. In addition, the food rations were insufficient and of poor quality. In 1878, the two principal Chiefs, Little Wolf and Morning Star (Dull Knife) pressed for the release of the Cheyenne so they could travel back north. That same year a group of 353 Cheyenne left Indian Territory to travel back north. This group was led by Chiefs Little Wolf and Morning Star. The Army and other civilian volunteers were in hot pursuit of the Cheyenne as they traveled north. It is estimated that a total of 13,000 Army soldiers and volunteers were sent to pursue the Cheyenne over the whole course of their journey north. 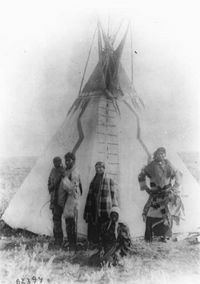 Stump Horn and family (Northern Cheyenne); showing home and horse-drawn travois. After crossing into Nebraska, the group split into two. One group was led by Little Wolf, and the other by Morning Star. Little Wolf and his band made it back to Montana. Morning Star and his band were captured and escorted to Fort Robinson, Nebraska. There Morning Star and his band were sequestered. They were ordered to return to Oklahoma but they refused. Conditions at the fort grew tense through the end of 1878 and soon the Cheyenne were confined to barracks with no food, water, or heat. In January of 1879, Morning Star and his group broke out of Ft. Robinson. Much of the group was gunned down as they ran away from the fort, and others were discovered near the fort during the following days and ordered to surrender but most of the escapees chose to fight because they would rather be killed than taken back into custody. It is estimated that only 50 survived the breakout, including Morning Star (Dull Knife). Several of the escapees later had to stand trial for the murders that had been committed in Kansas. With 2000 U.S. soldiers in pursuit, Chief Joseph led 800 Nez Perce toward freedom at the Canadian border. For over three months, the Nez Perce outmaneuvered and battled their pursuers traveling 1,700 miles across Oregon, Washington, Idaho, and Montana. Portrait of Plenty Coups (c. 1908). One of Montana's most revered Native American leaders was Plenty Coups. 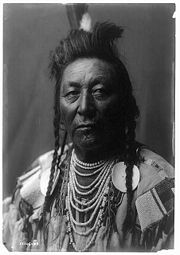 He was named Chief of the Mountain Crow in 1876 at age 28. As a young man and chief, he was a fierce and well-respected warrior. He was thought to have between 50-100 feathers on his coup stick, each one representing an act of valor. Plenty Coups became chief of the Crow Tribe the same year the Battle of the Little Bighorn took place. Four Crow warriors worked as scouts for General Custer at this time, and were allied with the white man in order to fight their own primary enemies during this period: the Lakota, Sioux and Cheyenne. His leadership during the transition to reservation life was instrumental in improving the lives of all Crow. His adoption of ranching and farming helped to provide the Crow nation with a sound economy. His opening of his own trade store provided an example to his people. His stance of collaboration and conciliation both with other Indian tribes and the white man were significant in promoting peace for his people as well as benefiting them with better opportunities than other tribes. He was selected to represent the Crow in Washington, D.C., where he fought successfully against the Dawes Commission plans to abolish the Crow nation and take away their lands. He made many trips to Washington during those ten years in order protect his people. His efforts enabled the Crow to keep their original land (although it amounted to only 80 percent of what they originally were allotted.) despite many foreigners desire to take the land for gold prospecting and other uses. Chief Plenty Coups was selected as the sole representative of Native Americans for the dedication of the Tomb Of The Unknown Soldier and gave a short speech in his native tongue in honor of the soldier and the occasion. He placed his war-bonnet and coup stick upon the tomb, and they are currently preserved in a display case there. On August 8, 1928 Plenty Coups presented his homestead for use as a park. 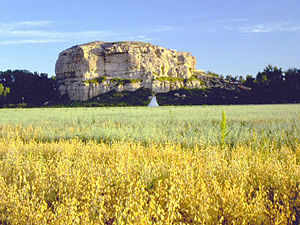 His home on the Crow Indian Reservation, 35 miles south of Billings, became Chief Plenty Coups State Park. This park is not a memorial to me, he declared during the dedication ceremony, but to the Crow nation. It is a token of my friendship for all people, red and white. In 1998, the site was designated a National Historic Landmark. Many Canadian Métis, from a word meaning 'mixed race', settled in Montana in the latter half of the nineteenth century. For a time, Louis Riel, a Canadian Métis politician and leader, taught school at Saint Peter's Mission and was active in local Republican Party politics. Some controversy resulted over his alleged signing up of Metis men to vote for the Republicans who were not American citizens. In the summer of 1884 a delegation of Metis leaders from the Saskatchewan Valley (in what is now the province of Saskatchewan, Canada) including Gabriel Dumont and James Isbister retrieved Riel to Canada, resulting in the Northwest Rebellion the following year. After the Rebellion, Louis Riel was executed on November 16, 1885 by hanging in the city of Regina, Saskatchewan following a controversial trial which continues to be re-enacted each year in Regina as a remembrance of this infamous piece of history. Gabriel Dumont fled to exile in Montana, later joining Buffalo Bill's Wild West Show. Subsequent to the Lewis and Clark Expedition and after the finding of gold and copper in the state in the late 1850s, Montana became a United States territory (Montana Territory) on May 26, 1864 and the 41st state on November 8, 1889. 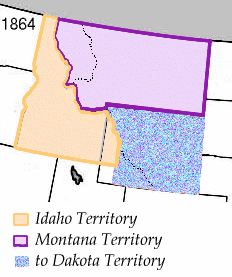 The reorganization of the Idaho Territory in 1864, showing the newly-created Montana Territory. 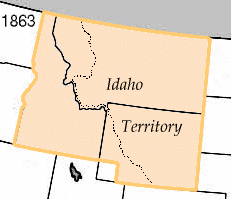 The territory was organized out of the existing Idaho Territory by Act of Congress and signed into law by President Abraham Lincoln on May 28, 1864. The areas east of the continental divide had been previously part of the Nebraska and Dakota territories and had been acquired by the United States in the Louisiana Purchase. 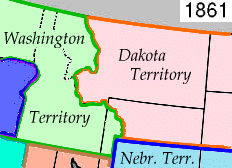 The boundary between the Washington Territory and Dakota Territory was the Continental Divide (as shown on the 1861 map), however the boundary between the Idaho Territory and the Montana Territory followed the Bitterroot Range north of 46°30'N (as shown on the 1864 map). Popular legend says a drunken survey party followed the wrong mountain ridge and mistakenly moved the boundary west into the Bitterroot Range. "the forty-fourth degree and thirty minutes of north latitude; thence due west along said forty-fourth degree and thirty minutes of north latitude to a point formed by its intersection with the crest of the Rocky Mountains; thence following the crest of the Rocky Mountains northward till its intersection with the Bitter Root Mountains; thence northward along the crest of the Bitter Root Mountains to its intersection with the thirty-ninth degree of longitude west from Washington; thence along said thirty-ninth degree of longitude northward to the boundary line of British possessions"
The boundaries of the territory did not change during its existence. It was admitted to the Union as the State of Montana on November 8, 1889. The revised Homestead Act of the early 1900s greatly affected the settlement of Montana. This act expanded the land that was provided by the Homestead Act of 1862 from 160 acres to 320 acres (65-130 hectares). When the latter act was signed by President William Taft, it also reduced the time necessary to prove up from five years to three years and permitted five months absence from the claim each year. In 1908, the Sun River Irrigation Project, west of Great Falls was opened up for homesteading. Under this Reclamation Act, a person could obtain 40 acres (16 ha). Most of the people who came to file on these homesteads were young couples who were eager to live near the mountains where hunting and fishing were good. Many of these homesteaders came from the Midwest and Minnesota. The largest wave of homesteaders did not arrive in Montana until after 1908 when the railroads were built. Homesteading was a very difficult way of life and many farms failed when droughts appeared from 1917, on and off through the Great Depression. Nevertheless, although today's Montana farmers are a minority lifestyle in Montana, agriculture remains an essential role in this state's economy. During World War II Montana powered up the nation by being a supplier of metal for building materials. Coal was available for fuel and the Montana ranchers raised beef production to feed the military. Cattle ranching has long been central to Montana's history and economy. The Grant-Kohrs Ranch National Historic Site in Deer Lodge Valley is maintained as a link to the ranching style of the late nineteenth century. It is operated by the National Park Service but is also a 1,900-acre (7.7 km²) working ranch. Montana beckons to those who love outdoor recreation, sports and the beautiful scenery of wide open spaces, mountains, lakes and sky. Helena (IPA: /ˈhɛlənə/) is the capital of the Montana, voted one of the "ten best places to live" by Money magazine for 2008. With a population of 27,800 and median income over $60,000. Montana State Capitol in Helena. The town was established on October 30, 1864, following the discovery of gold along Last Chance Creek by the Four Georgians. Helena's main street was named Last Chance Gulch and follows the winding path of the original creek through the historic downtown district. By 1888, about 50 millionaires lived in Helena, more millionaires per capita than any city in the world. About $3.6 billion (in today's dollars) of gold was taken from Last Chance Gulch over a 20-year period, with most of the production occurred before 1868. The Last Chance Placer was one of the most famous in the western United States. Much of it is now under the streets and buildings of Helena (but even as late as the 1970s, when repairs were being made to a Bank, a vein of placer gold was found under the Bank's foundation). In 1902, the Montana State Capitol was completed. Helena has been the capital of Montana Territory (since 1875) and the state of Montana (since 1889). The state was the first to elect a female member of Congress (Jeannette Rankin) and was one of the first states to give women voting rights. Despite its sizable American Indian population, Montana was one of the most homogenous states, with most of its residents are of European descent, with a large number of immigrants of German, Irish, Norwegian, Welsh, Cornish, Italian, Slovak and Scandinavian heritage arriving in the late nineteenth and early twentieth centuries. A significant portion of Chinese (Cantonese) immigrants also came and left an indelible mark on the state, especially in the mining cities of Helena, Butte, and Anaconda. Historically, Montana is a Swing state of cross-ticket voters with a tradition of sending conservatives to Helena (the state capital) and liberals to Washington. However, there have also been long-term shifts of party control. During the 1970s, the state was dominated by the Democratic Party, with Democratic governors for a 20-year period, and a Democratic majority of both the national congressional delegation and during many sessions of the state legislature. This pattern shifted, beginning with the 1988 election, when Montana elected a Republican governor and sent a Republican to the U.S. Senate for the first time since the 1940s. This shift continued with the reapportionment of the state's legislative districts that took effect in 1994, when the Republican Party took control of both houses of the state legislature, consolidating a party dominance that lasted until 2004. The state last supported a Democrat for president in 1992, Bill Clinton's first election. In recent years, Montana has been classified as a Republican-leaning state, and the state supported President George W. Bush by a wide margin in 2000 and 2004. However, since the 2000 reapportionment plan went into effect in 2004 the state currently has a Democratic governor (Brian Schweitzer), elected in 2004. In the 2006 midterm elections, Democratic candidate Jon Tester narrowly defeated (by only 3000 votes) incumbent Republican Senator Conrad Burns, one of several crucial races that allowed the Democratic Party to win the majority in the U.S. Senate. Montana's lone US Congressman, Republican Denny Rehberg, easily won reelection in a landslide. The state Senate is (as of 2007) controlled by the Democrats and the State House of Representatives is controlled by the Republicans. On April 17, 2007, Montana became the first state to pass legislation against the federal government's Real ID Act, requiring the true identity to be verified by all persons applying for a drivers' license. Gov. Schweitzer signed a bill banning the Montana Motor Vehicle Division from enforcing the new regulations. The Bureau of Economic Analysis estimates that Montana's total state product in 2003 was $26 billion. Per capita personal income in 2003 was $25,406, 47th in the nation. However, this number is rapidly increasing. According to the Missoulian, the economy has grown rapidly since 2003; in 2005, Montana ranked 39th in the nation with an average per capita personal income of $29,387. In Montana the economy is primarily based on agriculture—wheat, barley, sugar beets, oats, rye, seed potatoes, honey, cherries, are the main crops with wheat being the king crop grown. Ranchers raise cattle, hogs, sheep and American bison. Cattle raised for beef and dairy are in first place in the livestock division. The timber industry is still significant as well as the mining of gold, coal, silver, talc, and vermiculite. The manufacturing sector includes wood products, heavy machinery, aluminum production, oil refining, and food processing. The service industry employs more people than any other sector of Montana's economy which supports the importance of tourism to this great state's economy. 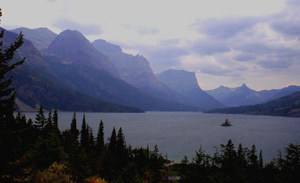 Millions of visitors flock each year to Montana's great National Parks and recreational areas. Flying is a favored mode of travel in this "Big Sky" state. Montana has 120 public use airports and an estimated 450 private use airstrips. There are nine commercial or primary service airports with scheduled passenger service and dozens of smaller, reliever airports that handle general aviation access to communities at large. In addition, Amtrak's Empire Builder train runs through the north of the state, stopping in: Libby, Whitefish, West Glacier, Essex, East Glacier Park, Browning, Cut Bank, Shelby, Havre, Malta, Glasgow, and Wolf Point. Montana State University - Bozeman MSU's growing prominence in research, with study topics ranging from fish to fuel cells, has helped move MSU into the Carnegie Foundation's top-tier of research universities. With roughly 13,000 students, MSU is considered a mid-sized public university with 826 instructional faculty. Its student-faculty ratio is 16 to 1. University of Montana|University of Montana - Missoula The University's 13,961 students receive a high-quality, well-rounded education and training for professional careers in its three colleges – arts and sciences, forestry and conservation, and technology – and six schools – journalism, law, business, education, pharmacy and the fine arts. Little Big Horn College Little Big Horn College is a public two year community college chartered by the Crow Tribe of Indians in 1980. The college is located in the town of Crow Agency, Montana (ASHKUALE), the heart of the Crow Indian Reservation in south central Montana. It was granted accreditation status in 1990 by the accrediting organization The Northwest Association of Schools and of Colleges and Universities. Accreditation was reaffirmed in 2001 by the Northwest Commission on Colleges and Universities. In 1994 Little Big Horn College, along with 28 other tribal colleges, was granted Land-Grant College status. Rocky Mountain College Founded in 1878, Rocky Mountain College is Montana's oldest institution of higher learning and one of the most distinctive in the American West. For eight consecutive years, Rocky has been ranked in the top 10 best comprehensive colleges in the West by U.S. News & World Report. A private comprehensive college offering more than 27 liberal arts and professionally oriented majors, Rocky has a diverse population of approximately 1,000 students who come from 37 states and 20 countries. 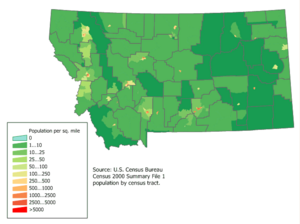 As of 2005, Montana has an estimated population of 935,670, which is an increase of 8,750, or 0.9 percent, from the prior year and an increase of 33,475, or 3.7 percent, since the year 2000. This includes a natural increase since the last census of 13,674 people (that is 58,001 births minus 44,327 deaths) and an increase due to net migration of 21,074 people into the state. Immigration from outside the United States resulted in a net increase of 2,141 people, and migration within the country produced a net increase of 18,933 people. 16,500 of state residents are foreign-born, accounting for 1.8 percent of the total population. According to the 2005 U.S. Census, 1.37 percent of the population of Montana aged 5 and over speak Spanish at home, while 0.08 percent speak German, and 95 percent speak English. While German ancestry is the largest reported European-American ancestry in most of Montana, residents of Scandinavian ancestry are prevalent in some of the farming-dominated northern and eastern prairie regions. There are also several predominantly Native American counties, mostly around each of the seven Indian reservations. The historically mining-oriented communities of western Montana such as Butte have a wider range of ethnic groups, particularly people of Eastern European and Irish-American ancestry, as well as people who originally emigrated from British mining regions such as Cornwall. Montana is second only to South Dakota in U.S. Hutterite population with several colonies spread across the state. Many of Montana's historic logging communities originally attracted people of Scandinavian and Scots-Irish descent. Montana's Hispanic population is particularly concentrated around the Billings area in south-central Montana, and the highest density of African-Americans is located in Great Falls. Several Indian reservations are located in Montana: Fort Peck Indian Reservationwith an estimated 11,786 enrolled tribal members, with approximately 6,000 residents, Fort Belknap Indian Reservation, Northern Cheyenne Indian Reservation, Crow Indian Reservation claims over 10,000 members, Rocky Boy's Indian Reservation, Blackfeet Indian Reservation with 15,200 enrolled members of which 8,650 are off-reservation and 7,000 residents, and the Flathead Indian Reservation covers more than 1.3 million acres with over 12,000 tribal members on reservation and another 3,000 living off reservation,. The planned battleships USS Montana were named in honor of the state. However, neither battleship was completed, making Montana the only state of the 48 states during World War II not to have a battleship named after it. Additionally, Alaska and Hawaii have both had nuclear submarines named after them. As such Montana is the only state in the union without a modern naval ship named in honor of it. Montana is home to various non-traditional religious groups. There is a religious diversity in Montana that may not be obvious on the surface. Native American religion, Hutterite colonies, Buddhism, Baha'i, Islam and several other unique religious communities flourish in the wide open spaces of this large and isolated state. Interfaith associations can be found in the larger cities. Montana contains Glacier National Park and portions of Yellowstone National Park, including three of the Park's five entrances. Other federally recognized sites include the Little Bighorn National Monument, Bighorn Canyon National Recreation Area, Big Hole National Battlefield, Lewis and Clark Caverns, and the National Bison Range. Montana has eight National Forests and over 20 National Wildlife Refuges. The Federal government administers 36,000,000 acres (146,000 km²). 275,000 acres (1,100 km²) are administered as state parks and forests. The Hell Creek Formation is a major source of dinosaur fossils. Paleontologist Jack Horner, of the Museum of the Rockies in Bozeman, Montana, brought this formation to the world's attention with several major finds. For example, Jane was discovered in 2001 in Hell Creek and is the world's most complete juvenile tyrannosaurus rex. In 1902, a group of female students from the Fort Shaw Indian Industrial School began playing basketball and traveled throughout Montana, defeating high school teams and some college teams. In 1904, the girls' basketball team traveled by train to the Saint Louis World's Fair. Over a period of five months, the team was challenged by numerous other basketball teams and won every contest, returning to Fort Shaw with the "world champion" trophy. On May 1, 2004, a monument in honor of the basketball team was unveiled at the entrance of the present-day Fort Shaw Elementary School. In the movie 'Star Trek: First Contact', Montana is the location of the fictitious first contact between humans and an alien race, the Vulcans. Star Trek producer Brannon Braga is originally from Bozeman, Montana. Montana's triple divide allows water to flow into three oceans: the Pacific Ocean, the Atlantic Ocean (Gulf of Mexico), and the Arctic Ocean (Hudson Bay). This phenomenon occurs at Triple Divide Peak in Glacier National Park. 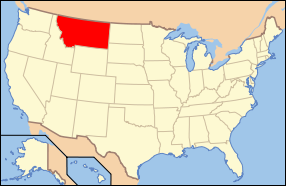 Montana is one of two states in the continental United States which, in addition to not having a major metropolitan area over 1,000,000 in population, also does not border a state that does have one (Maine is the other). However, it does border the Canadian Provinces Alberta (population in 2005 of 3,237,000) and British Columbia (population in 2006 of 4,292,000, which have a combined three cities with a metro population of over 1,000,000 each. Quake Lake was formed during the 1959 earthquake of the Yellowstone Area. Some famous Montanans are: Chief Plenty Coups of the Crow nation (Native American leader who sought to have a peaceful relationship with whites), Jeanette Rankin, (first American woman to serve in the U.S. House of Congress, 1916), and economist Lester C. Thurow. Doug Swingley (Iditarod champion several times), Jack Horner (paleontologist), journalist Chet Huntley. Entertainers include actress Myrna Loy, actors Gary Cooper and George Montgomery, Dana Carvey (actor and comedian), and Evel Knievel (motorcycle stuntman). In the fields of art and literature, Charles M. Russell (western artist) and Alfred Bertram Guthrie, Jr. winner of the Pulitzer Prize for Literature for The Way West (1949), his sequel to The Big Sky, are world known. ↑ 1.0 1.1 Elevations and Distances in the United States. United States Geological Survey (2001). Retrieved October 24, 2011. ↑ 2.0 2.1 Elevation adjusted to North American Vertical Datum of 1988. ↑ State and County QuickFacts Quickfacts.census.gov. Retrieved January 11, 2008. ↑ Montana Encarta.msn.com. Retrieved January 9, 2008. ↑ An Act to provide a temporary Government for the Territory of Montana. Thirty-sixth United States Congress. 1864-05-26.Retrieved October 8, 2007. ↑ Sen. Burns Concedes Defeat to Tester in Montana Senate Race, Associated Press, Nov. 9, 2006, /foxnews. ↑ Two states lead revolt against Real ID, By Eric Kelderman, April 18, 2007, .stateline.org. Retrieved July 20, 2008. ↑ Most spoken languages in Montana Mla.org. Retrieved July 20, 2008. ↑ Population and Population Centers by State: 2000 Census.gov. Retrieved January 10, 2008. ↑ Fort Peck Tribes.fortpecktribes. Retrieved July 20, 2008. ↑ , Fort Belnap Montana Tribal Tourism Alliance.bigskytribes.com. Retrieved July 20, 2008. ↑ Northern Cheyenne Tribe.cheyennenation.com. Retrieved July 20, 2008. ↑ Welcome to Blackfeet Nation..blackfeetnation.com. Retrieved July 20, 2008. Kittredge, William. The Last Best Place: A Montana Anthology. (From the back cover: over 230 stories, poems, reminiscences, and reports written by 140 men and women. University of Washington: 1990. ISBN 0295969741. Howard, Joseph Kinsey. Montana Margins: A State Anthology. Yale University Press, 1946. ISBN 0836926528. Toole, K. Ross. Montana: An Uncommon Land. University of Oklahoma: 1984. ISBN 0806118903. MacLean, Norman. A River Runs Through It. University of Chicago Press, 1976.ISBN 0226500608. MacLean, Norman. Young Men and Fire. University of Chicago Press: 1992. ISBN 0226500616. Walker, Mildred. Winter Wheat. Harcourt: 1967. ISBN 0151972230. This page was last modified on 18 October 2018, at 17:03.